Pull up a chair, I’m going to tell you a funny, though slightly depressing, story. See, on Valentine’s Day, I was alone in New York. Craig would be coming a few days later and, in the meantime, I decided to spend the night seeing a play I’d always wanted to see: David Ives’ “All In The Timing” at 59E59. (A terrific production, by the way.) I figured seeing a play by myself on Valentine’s Day wouldn’t be a big deal; once the lights go down, who cares that you’re alone? The real issue was getting food before the show started. Eating out alone on Valentine’s Day, now that’s a different story. If I were a normal person, and not a food nut, I would’ve just grabbed a sandwich somewhere or eaten a quick bite at home. Instead, I set my sights on a restaurant. My brain has a map of New York with a grid of restaurants laid on top of it. If you name a neighborhood, I can tell you where to eat. 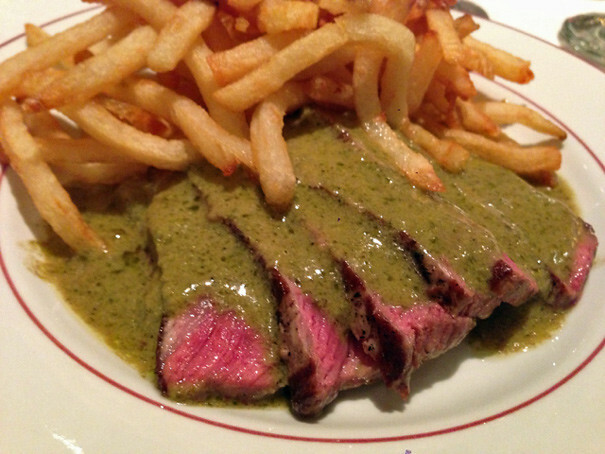 And in this particular neighborhood, I knew there was a fascinating little French steakhouse called Le Relais de Venise L’Entrecote that came to the city straight from Paris and made a name for itself by offering a menu with only three items on it: salad, steak and frites. The restaurant was practically empty when I walked in, which is why I chose it. 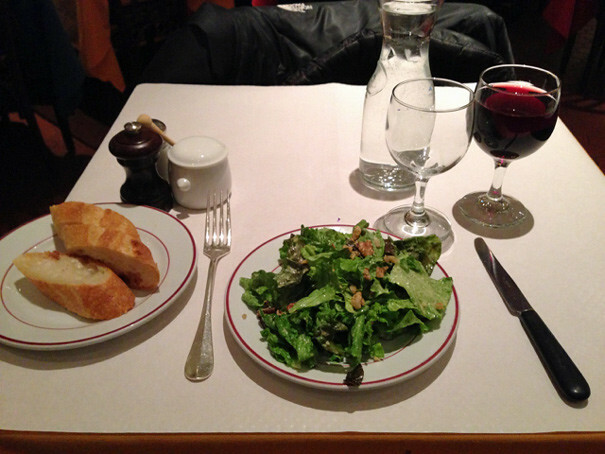 I also liked that the meal was already determined: the salad course, the meat course, and I’d be out of there. I ordered myself a glass of red wine and studied the one or two tables with people while scrolling through Twitter on my phone. That’s when it started happening: couples started showing up. Before I knew it, I was surrounded by couples on their Valentine’s Day dates and I was sitting there alone, not even a magazine to keep me company. I looked like the most pathetic human being on the planet. Now, I realize most of this was happening in my head. In reality, I was just eating a meal in a restaurant with lots of other people. But come on. 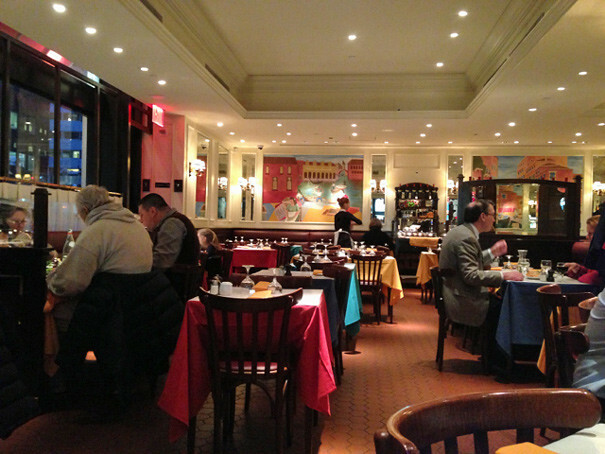 If there’s one night of the year you don’t want to be eating alone at a restaurant–let alone a relatively romantic French restaurant on the Upper East Side–it’s Valentine’s Day. I felt like I was on a bad sitcom: the longer I sat there, the more Valentine’s Day couples began to show up. 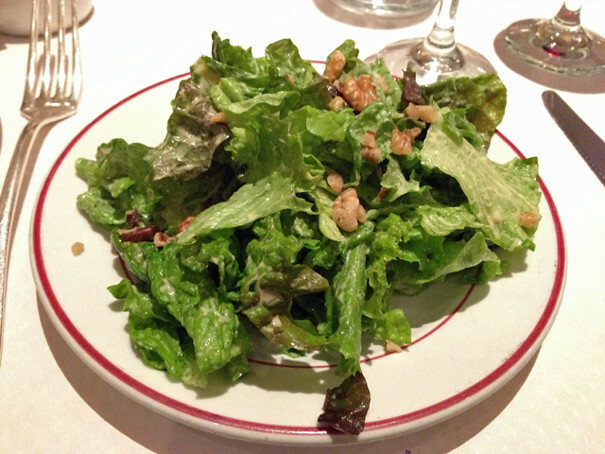 After lots of soul-searching, I decided I only had one option: to completely eavesdrop on the couple sitting next to me while eating this very good, very mustardy salad with walnuts. The couple hadn’t been dating long, that was clear. The guy had sent the girl flowers at work. “How did you get the address?” she asked. “I looked it up on Google,” he said. Waiter, get me another drink. When the meal was over, my bill came to $47. Not cheap, true, but for a satisfying French steak dinner with wine, pretty reasonable. I paid the check and then booked it out of there faster than you can say, “Be mine.” Next Valentine’s Day, I’m ordering a pizza. 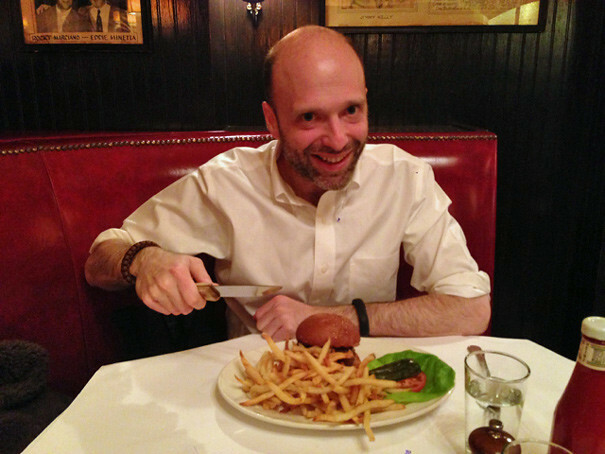 The day before, I had a much less lonely experience with my friend James Felder at The Minetta Tavern. If you look carefully you’ll see that it’s topped with a layer of caramelized onions. That’s it. The waitress suggested we eat it just like that to really experience the quality of the beef. And you know what? She was right. That beef flavor was so pure and deep, it is to the In-N-Out burger what Catherine Deneuve is to a Bada-Bing stripper from “The Sopranos.” In case you find that sexist, let me switch genders. It is to the In-N-Out burger what Jean Dujardin is to Ron Jeremy. Got it? 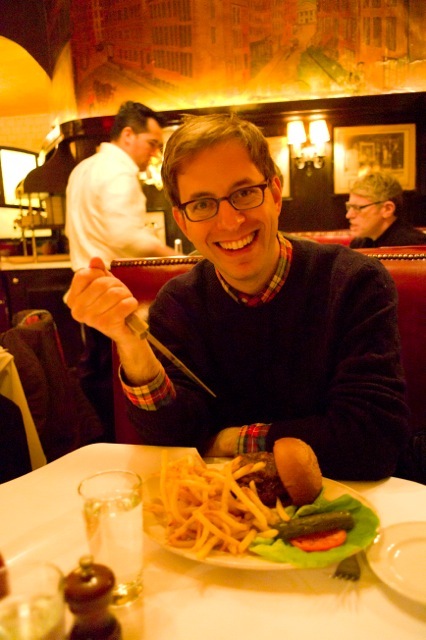 As much as we both loved our burgers, James and I agreed that we wouldn’t be rushing back to eat them again anytime soon. 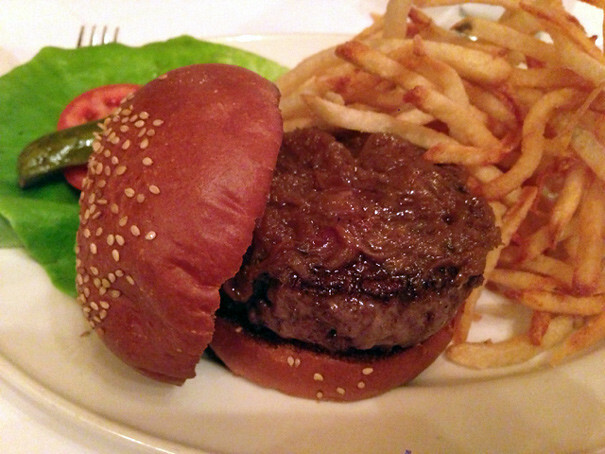 $26 is a big price to pay and, at the end of the day, it’s ground up meat on a bun. Burgers aren’t meant to be hoighty-toighty affairs, they’re meant to be eaten out of a paper bag, preferably with friends, under fluorescent lights. 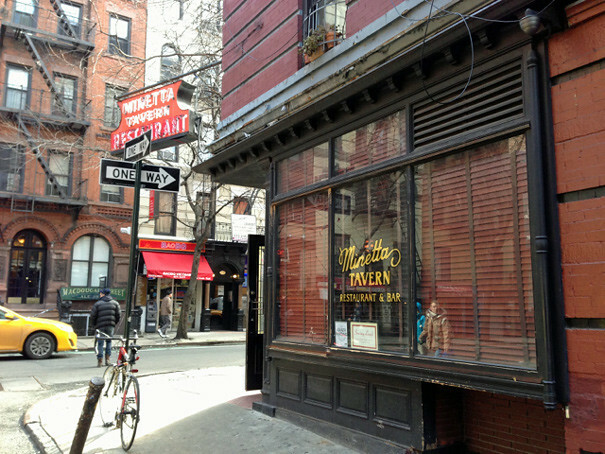 Still, if you want the ultimate burger experience–as refined a burger as you can imagine–Minetta Tavern is the place to have it. Just don’t go alone on Valentine’s Day.